If your knees hit the sink while you're on the toilet, this one's for you. 1. 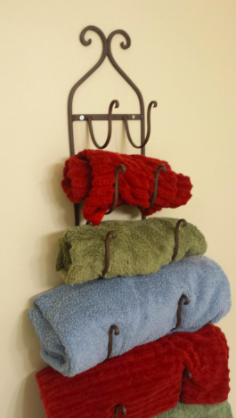 Use a wine holder as a swanky, spacious towel rack. Try it out with one you already have at home (and then raise a glass of wine to yourself for achieving this hack), or get one from Amazon for $21.28, Walmart for $21.28, or Jet for $26.27. 2. Or, hang some hooks that'll take up even less space. 3. You could also store towels in some floating baskets. The best part? It'll only take you about five minutes to set up this cute storage solution. Just follow these instructions. 4. 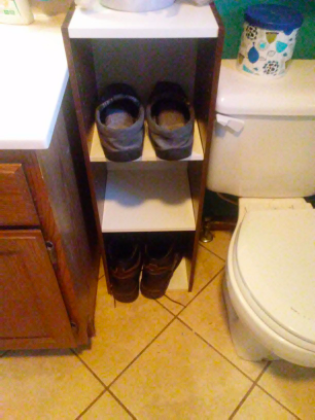 Repurpose an over-the-door shoe holder to store toiletries and cleaning supplies. Low on cabinet space? Voilà! This hack offers plenty of spots to organize all of those bottles you can't find a place for. Get one from Amazon for $7.87. 5. 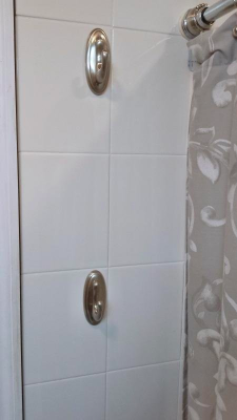 Or, install a shelf over your bathroom door. 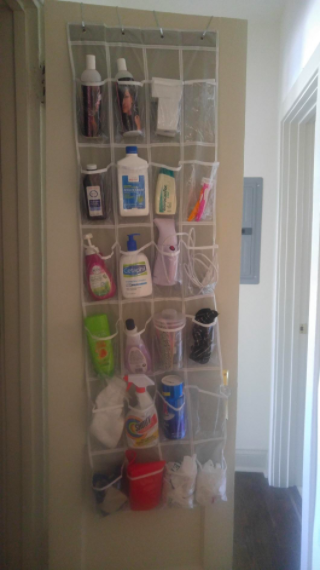 You can put lesser-used items up there, like extra toilet paper or big bottles of shampoo and conditioner, and can even hide items in beautiful baskets for an elegant touch. Use wood screws to secure a pair of wooden shelf brackets to either side of the door frame, then screw the shelf to the brackets. The door moulding will help support the weight. Check out this tutorial. 6. 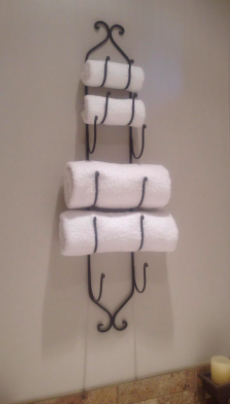 Add a second rod in your shower to make room for all of your poufs, bottles, and kids' toys. 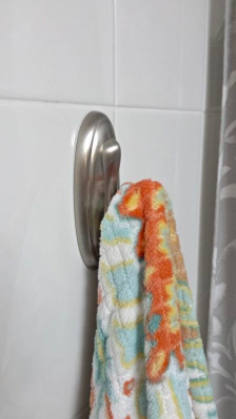 Use shower curtain hooks to secure baskets to the rod (go for baskets with holes so that water can drain). H/T Reddit. Get some lil' baskets on Amazon for $7.99 or Jet for $13.51. 7. A shower curtain 🚨 WITH POCKETS 🚨 will also get the job done. You know that amazing feeling when a piece of clothing, like a dress or a jacket, has unexpected pockets? It's like that but with a shower curtain. Get one from Amazon for $17.80 or Walmart for $17.81. 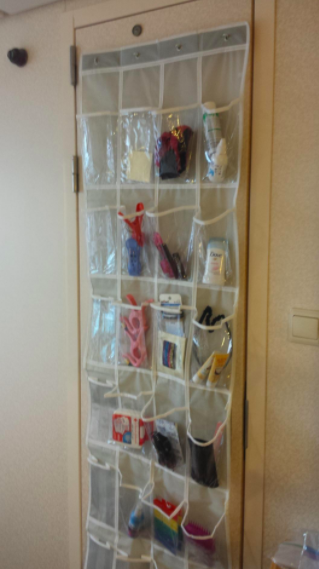 Or, you can make your own storage curtain using a hanging utility bag. 8. Hang your cleaning supplies from a tension rod under your sink to get them out of the way. Spray bottles, am I right? They take up so much room and fall all over the place when you're just trying to find your lint roller. A simple tension rod will solve that issue. Here's a tutorial. 9. 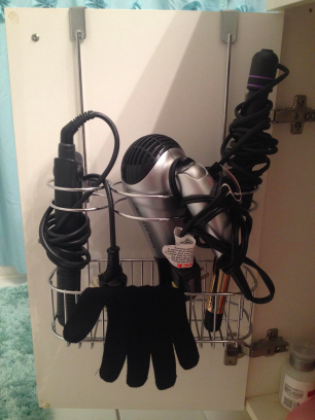 Store bulky hair tools in a caddy or file holder under your sink. 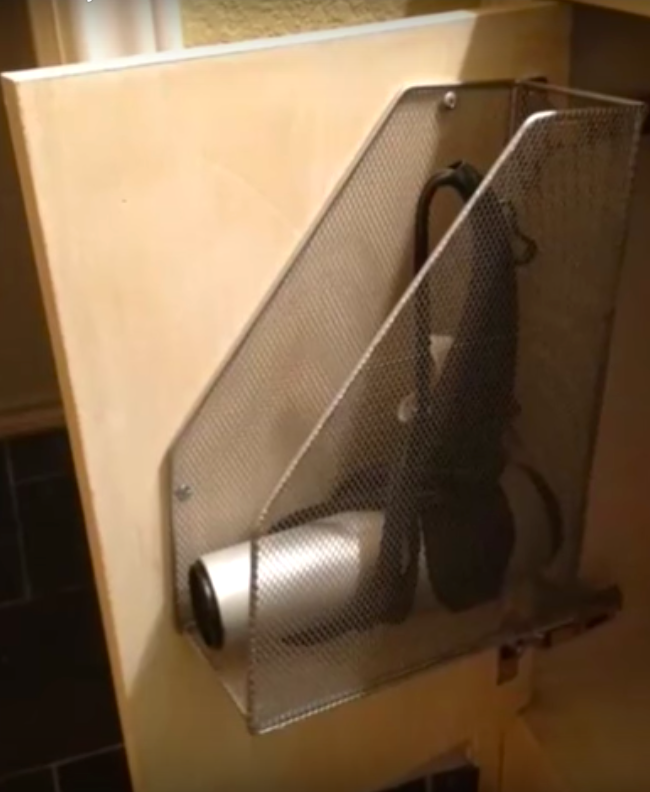 No more tossing your hot hair dryer into a cabinet and letting it fall out onto the next person who opens it. Get a caddy from Amazon for $22.99, Walmart for $19.99, or Jet for $19.99. Or, drill a file holder to the door for a DIY approach. 10. Have a pedestal sink? Maximize the space underneath it with some corner shelves. No under-the-sink storage? No problem! These shelves are designed to fit that valuable space. Get them from IKEA for $39.99. 11. Hang a spice rack beside your sink to hold toiletries. You could even paint or stain it if you want it to match the color scheme of your bathroom. And if you'd prefer to keep it out of sight, mount it on a cabinet door instead. 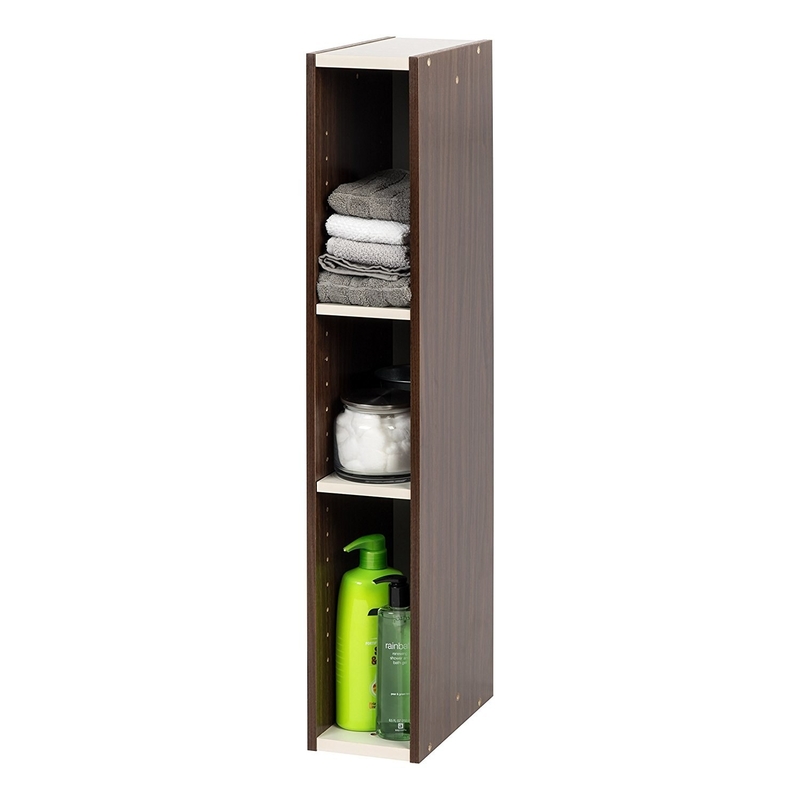 Get one from IKEA for $3.99. 12. Mason jars will do the trick, too. This DIY will give your bathroom a ~rustic-chic~ touch. Here are the directions. 13. You could also stick little organizers on the inside of your medicine cabinet to hold cosmetics. These StickOnPods are ideal for holding small things like makeup and toothbrushes, making the most of a limited medicine cabinet. 14. Install a picture ledge above your sink and use it as extra counter space. Don't let the space between your sink and mirror go to waste. Mount a narrow ledge there for some added storage, or to display some nice soaps, lotions, or candles. Get a Command picture ledge from Amazon for $19.84 or Walmart for $19.84. IKEA also has one for $6.99. 15. And squeeze a skinny cabinet next to your sink. Take advantage of every bit of space in your tiny bathroom, even the spot between the toilet and sink, which is perfect for a thin cabinet. Get one from Amazon for $24.99, Walmart for $27.99, or Jet for $27.99.